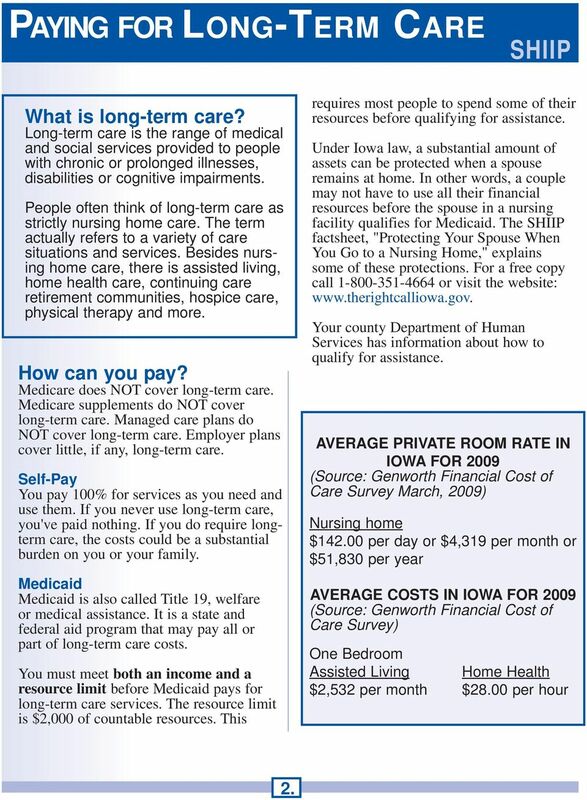 Download "T L n g INSURANCE IOWA GUIDE TO LONG-TERM CARE INSURANCE THE TIME TO EXPLORE YOUR THE SENIOR HEALTH INSURANCE INFORMATION PROGRAM"
3 CONTENTS Using This Guide Paying For Long-Term Care Is Long-Term Care Insurance a Suitable Purchase for You? How To Shop For Long-Term Care Insurance Company and Agent Information What Does the Policy Cover? How Much Will the Policy Pay? How Do You Qualify for Benefits? 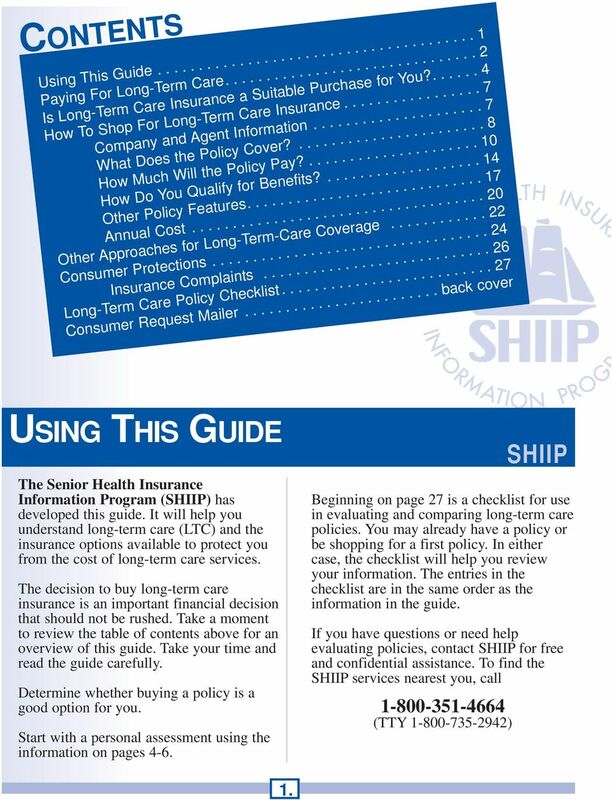 Other Policy Features Annual Cost Other Approaches for Long-Term-Care Coverage Consumer Protections Insurance Complaints Long-Term Care Policy Checklist Consumer Request Mailer back cover USING THIS GUIDE The Senior Health Insurance Information Program (SHIIP) has developed this guide. It will help you understand long-term care (LTC) and the insurance options available to protect you from the cost of long-term care services. The decision to buy long-term care insurance is an important financial decision that should not be rushed. Take a moment to review the table of contents above for an overview of this guide. Take your time and read the guide carefully. Determine whether buying a policy is a good option for you. Start with a personal assessment using the information on pages 4-6. 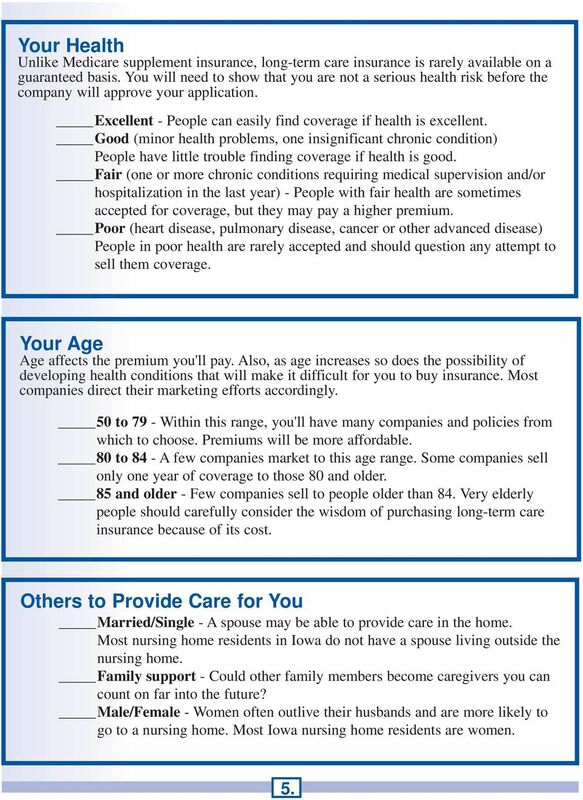 Beginning on page 27 is a checklist for use in evaluating and comparing long-term care policies. You may already have a policy or be shopping for a first policy. In either case, the checklist will help you review your information. The entries in the checklist are in the same order as the information in the guide. If you have questions or need help evaluating policies, contact SHIIP for free and confidential assistance. To find the SHIIP services nearest you, call (TTY ) SHIIP 1. 4 PAYING FOR LONG-TERM CARE SHIIP What is long-term care? Long-term care is the range of medical and social services provided to people with chronic or prolonged illnesses, disabilities or cognitive impairments. People often think of long-term care as strictly nursing home care. The term actually refers to a variety of care situations and services. Besides nursing home care, there is assisted living, home health care, continuing care retirement communities, hospice care, physical therapy and more. How can you pay? Medicare does NOT cover long-term care. Medicare supplements do NOT cover long-term care. Managed care plans do NOT cover long-term care. Employer plans cover little, if any, long-term care. Self-Pay You pay 100% for services as you need and use them. If you never use long-term care, you've paid nothing. If you do require longterm care, the costs could be a substantial burden on you or your family. Medicaid Medicaid is also called Title 19, welfare or medical assistance. It is a state and federal aid program that may pay all or part of long-term care costs. You must meet both an income and a resource limit before Medicaid pays for long-term care services. The resource limit is $2,000 of countable resources. This requires most people to spend some of their resources before qualifying for assistance. Under Iowa law, a substantial amount of assets can be protected when a spouse remains at home. In other words, a couple may not have to use all their financial resources before the spouse in a nursing facility qualifies for Medicaid. The SHIIP factsheet, "Protecting Your Spouse When You Go to a Nursing Home," explains some of these protections. For a free copy call or visit the website: Your county Department of Human Services has information about how to qualify for assistance. AVERAGE PRIVATE ROOM RATE IN IOWA FOR 2009 (Source: Genworth Financial Cost of Care Survey March, 2009) Nursing home $ per day or $4,319 per month or $51,830 per year AVERAGE COSTS IN IOWA FOR 2009 (Source: Genworth Financial Cost of Care Survey) One Bedroom Assisted Living Home Health $2,532 per month $28.00 per hour 2. 5 Long-Term Care Insurance Options If you select the right policy for you, long-term care insurance can protect you, your family and your assets against the financial burdens of providing for longterm care. The long-term cost of a policy can be significant, but it is minor compared with potential out-of-pocket costs. This guide explains how to shop for and understand long-term care insurance. Individual policies - Most long-term care insurance is sold to individuals. Policies are sold through agents, directly by telephone or mail and through the Internet. Many types of policies are available. Some companies may offer several policies with different combinations of benefits. An agent may deal with many companies and can help you get coverage that best fits your needs. Employer group policies - You may be able to buy long-term care coverage through your employer or in some cases your child's employer. These generally have coverage similar to that of individual policies. The advantages to buying coverage this way can be less extensive medical screening and a better package of benefits for less premium. buy insurance, consider the cost of membership in the total cost of coverage. Partnership policies - In Iowa certain policies that work in partnership with Medicaid are available. These policies are designed to protect some of your resources if you use all the policy benefits. As you begin to pay for your care, you don't need to use the protected resources to become eligible for Medicaid. Partnership policies are appropriate only for individuals who can meet the income limit for Medicaid eligibility. The Federal Long- Term Care Insurance Program - Congress authorized a special program for federal employees, retirees, their spouses and parents in some cases. This program is governed by federal law and does not necessarily follow the state laws and regulations discussed in this guide. To get more information call LTC-feds ( ) or visit the web site Association policies - Many associations work with insurance companies to offer long-term care coverage to their membership. Like other group plans, a choice of options is usually available. If you are joining an association just to 3. 6 IS LTC INSURANCE A SUITABLE PURCHASE FOR YOU? SHIIP M any people approach the purchase of long-term care insurance backwards. They look at a few policies (by choice or an agent's prompting), buy a policy and then decide if they really want it. The first step in shopping for long-term care insurance should be to determine whether this is a suitable purchase for your situation. Start by assessing your personal objectives, needs, limitations and financial situation. When you apply for a policy, the agent or company is also required to do an assessment before issuing coverage. This is a difficult decision to make on your own. You may want to consult with family members, a financial advisor or an attorney. You can meet with a SHIIP health insurance counselor who can answer your questions and help you understand your choices. 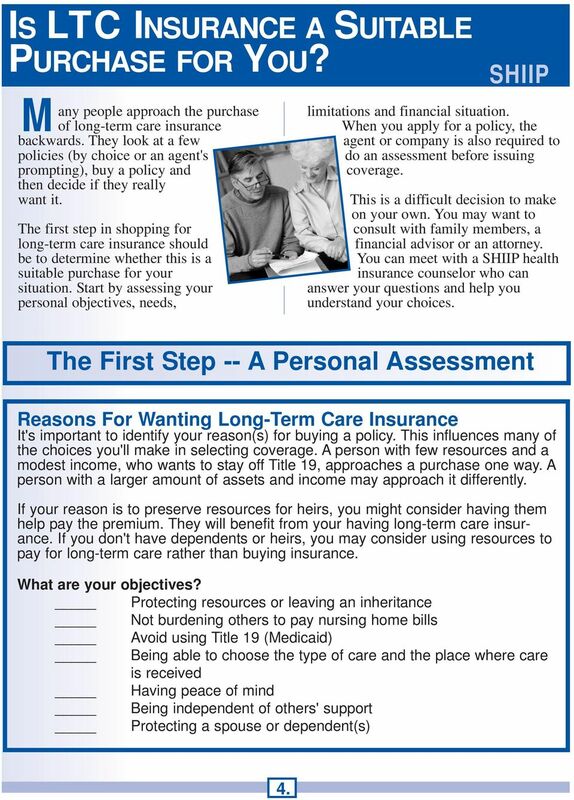 The First Step -- A Personal Assessment Reasons For Wanting Long-Term Care Insurance It's important to identify your reason(s) for buying a policy. This influences many of the choices you'll make in selecting coverage. A person with few resources and a modest income, who wants to stay off Title 19, approaches a purchase one way. A person with a larger amount of assets and income may approach it differently. If your reason is to preserve resources for heirs, you might consider having them help pay the premium. They will benefit from your having long-term care insurance. If you don't have dependents or heirs, you may consider using resources to pay for long-term care rather than buying insurance. What are your objectives? Protecting resources or leaving an inheritance Not burdening others to pay nursing home bills Avoid using Title 19 (Medicaid) Being able to choose the type of care and the place where care is received Having peace of mind Being independent of others' support Protecting a spouse or dependent(s) 4. 7 Your Health Unlike Medicare supplement insurance, long-term care insurance is rarely available on a guaranteed basis. You will need to show that you are not a serious health risk before the company will approve your application. Excellent - People can easily find coverage if health is excellent. Good (minor health problems, one insignificant chronic condition) People have little trouble finding coverage if health is good. Fair (one or more chronic conditions requiring medical supervision and/or hospitalization in the last year) - People with fair health are sometimes accepted for coverage, but they may pay a higher premium. Poor (heart disease, pulmonary disease, cancer or other advanced disease) People in poor health are rarely accepted and should question any attempt to sell them coverage. Your Age Age affects the premium you'll pay. Also, as age increases so does the possibility of developing health conditions that will make it difficult for you to buy insurance. Most companies direct their marketing efforts accordingly. 50 to 79 - Within this range, you'll have many companies and policies from which to choose. Premiums will be more affordable. 80 to 84 - A few companies market to this age range. Some companies sell only one year of coverage to those 80 and older. 85 and older - Few companies sell to people older than 84. Very elderly people should carefully consider the wisdom of purchasing long-term care insurance because of its cost. Others to Provide Care for You Married/Single - A spouse may be able to provide care in the home. Most nursing home residents in Iowa do not have a spouse living outside the nursing home. Family support - Could other family members become caregivers you can count on far into the future? Male/Female - Women often outlive their husbands and are more likely to go to a nursing home. Most Iowa nursing home residents are women. 5. 8 Your Annual Income The purchase of long-term care insurance should not cause financial hardship or prevent you from meeting your basic needs. If premiums cannot be paid from current income, long-term care insurance should not be purchased. You need to consider your ability to pay premiums now and in the future. While Iowa regulations limit a company s ability to raise rates, possibility of an increase still exists. Is your only source of income Social Security or Supplemental Security Income (SSI)? If it is, this is not an appropriate purchase for you. Is the long-term care policy premium less than 7% of your income (rule of thumb for affordability)? Could you still pay the premium if it was increased by 25%? Cash Value of Assets Excluding Your Primary Residence The cost of long-term care insurance is significant. If protecting assets is your reason for buying, you should have substantial assets to protect. Your home is protected as long as a spouse lives there. Additional resources also can be protected for a spouse. Obtain the SHIIP fact sheet, "Protecting Your Spouse When You Go to a Nursing Home," by calling or visit the web site: These amounts represent individual resources. They would double for a couple. Less than $30,000 - You might spend as much in premium over several years as the value of assets being protected. $30,000-$75,000 - Carefully review your resources to see if the amount you are protecting justifies the premium you'll pay. $75,000 and up - Long-term care insurance may be an appropriate way to save assets for your own security or estate. 6. 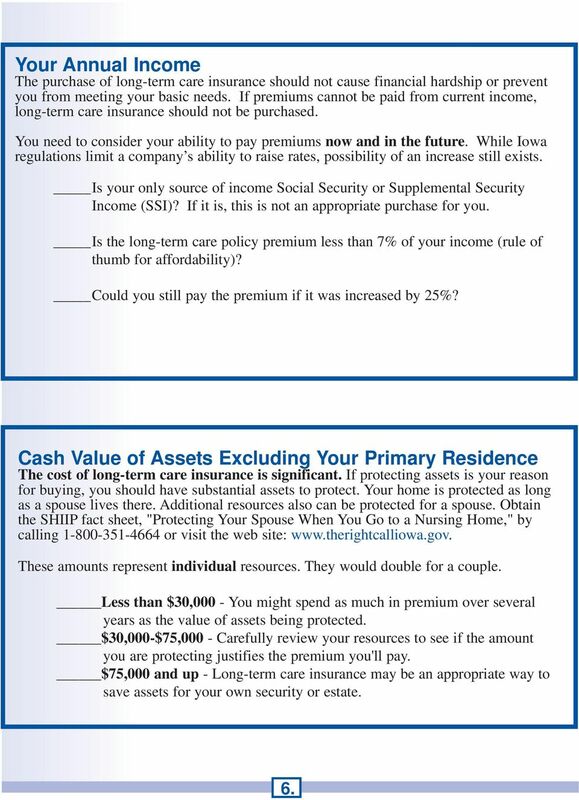 9 HOW TO SHOP FOR LTC INSURANCE SHIIP I f your personal assessment (from pp. 4-6) shows that long-term care insurance may meet your needs and is affordable, it's time to start shopping for a policy. Compare several policies from different companies. When buying longterm care insurance, what you choose affects the coverage you'll have and the premium you'll pay. Use the chart starting on page 27 to compare and evaluate policies you are considering. The discussion in the following pages focuses on these issues: Are you working with a reliable company and agent? What types of services and care does the policy cover? How much will the policy pay? How do you qualify for policy benefits? Company and Agent Information 1. Is the insurance company financially strong? People usually buy long-term care insurance several years before they plan to use it. That means it's important to buy from a financially stable company. An agent should provide this information at the beginning of your appointment. You can check with several independent rating services. These include A.M. Best, Fitch Investor Service, Inc., Moody's Investor Service, Standard & Poor s, and Weiss Research, Inc. The best source of current rating information is the Internet. All Iowa public libraries have Internet access, and librarians can help you. 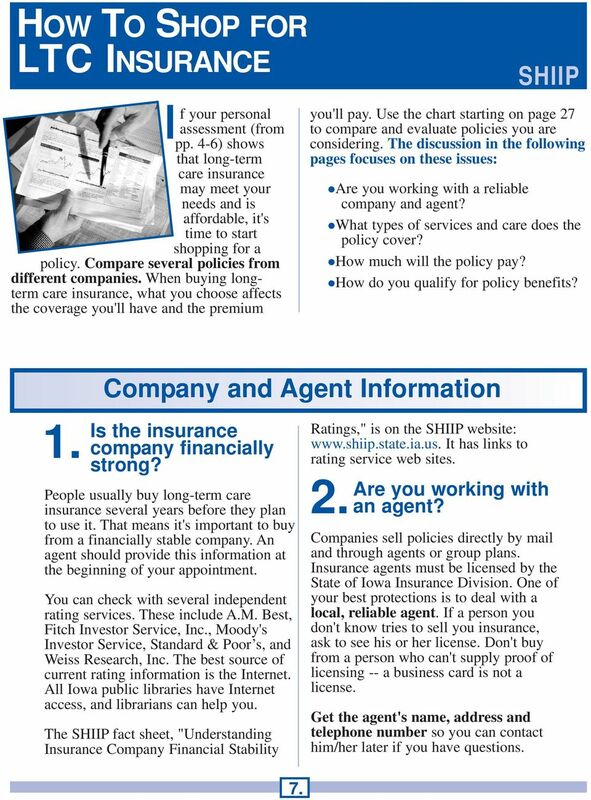 The SHIIP fact sheet, "Understanding Insurance Company Financial Stability Ratings," is on the SHIIP website: It has links to rating service web sites. 2. Are you working with an agent? Companies sell policies directly by mail and through agents or group plans. Insurance agents must be licensed by the State of Iowa Insurance Division. One of your best protections is to deal with a local, reliable agent. If a person you don't know tries to sell you insurance, ask to see his or her license. Don't buy from a person who can't supply proof of licensing -- a business card is not a license. Get the agent's name, address and telephone number so you can contact him/her later if you have questions. 7. 10 What Does the Policy Cover? 3. What types of services and care are covered? Several years ago only nursing home insurance was sold. Today the policies are called long-term care insurance because they may cover different facilities and home and community-based services. Coverage can include nursing home care as well as assisted living, home health care, respite care, adult day care, hospice care and others. You may have Medicare or other insurance benefits that pay for some types of long-term care services. A long-term care policy being sold today will not pay for services if they are covered by other sources. Check to see if a long-term care policy you are considering has benefits that duplicate any you already have. To decide which types of care you want a policy to include, identify the types of care available in the area where you would live if you ever need long-term care. This may be near a child in another state or in a retirement location. It's important to understand exactly what types of services and care the policy covers. The "Definitions" section of the insurance policy will define coverage for each type of service. Different policies can define these differently. Facility Care Nursing home care is care received in a facility that is appropriately licensed by the state where it is located. Check the definition in the policy for the types of facilities covered. Also, check carefully for facilities that are not eligible for policy benefits. Assisted living facilities are not considered nursing homes. Don't assume a policy that covers nursing home care will pay if you are in an assisted living facility. Read policy definitions carefully. 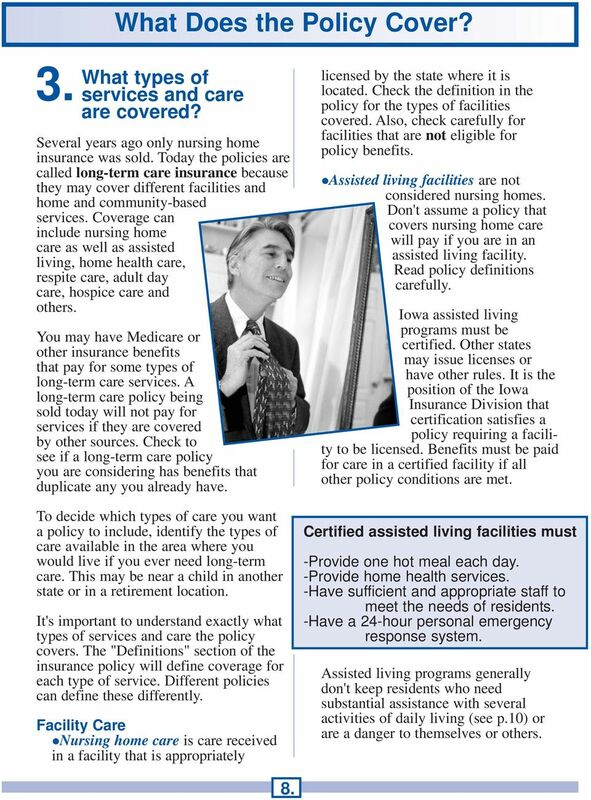 Iowa assisted living programs must be certified. Other states may issue licenses or have other rules. It is the position of the Iowa Insurance Division that certification satisfies a policy requiring a facility to be licensed. Benefits must be paid for care in a certified facility if all other policy conditions are met. Certified assisted living facilities must -Provide one hot meal each day. -Provide home health services. -Have sufficient and appropriate staff to meet the needs of residents. -Have a 24-hour personal emergency response system. Assisted living programs generally don't keep residents who need substantial assistance with several activities of daily living (see p.10) or are a danger to themselves or others. 8. 11 Home and Community-based Care Home health care is care received in your home. Skilled care, therapy and services from a home health aide may be covered. Most policies pay for only a few hours of home care a day. This doesn't provide the assistance needed to remain at home if you have no other help. Be sure you understand this benefit. 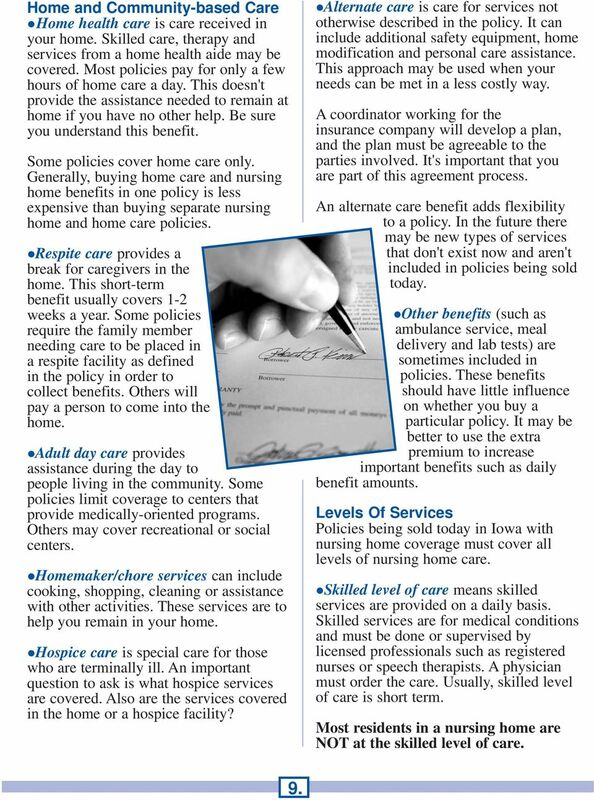 Some policies cover home care only. Generally, buying home care and nursing home benefits in one policy is less expensive than buying separate nursing home and home care policies. Respite care provides a break for caregivers in the home. This short-term benefit usually covers 1-2 weeks a year. Some policies require the family member needing care to be placed in a respite facility as defined in the policy in order to collect benefits. Others will pay a person to come into the home. Adult day care provides assistance during the day to people living in the community. Some policies limit coverage to centers that provide medically-oriented programs. Others may cover recreational or social centers. Homemaker/chore services can include cooking, shopping, cleaning or assistance with other activities. These services are to help you remain in your home. Hospice care is special care for those who are terminally ill. An important question to ask is what hospice services are covered. Also are the services covered in the home or a hospice facility? Alternate care is care for services not otherwise described in the policy. It can include additional safety equipment, home modification and personal care assistance. This approach may be used when your needs can be met in a less costly way. A coordinator working for the insurance company will develop a plan, and the plan must be agreeable to the parties involved. It's important that you are part of this agreement process. An alternate care benefit adds flexibility to a policy. In the future there may be new types of services that don't exist now and aren't included in policies being sold today. Other benefits (such as ambulance service, meal delivery and lab tests) are sometimes included in policies. These benefits should have little influence on whether you buy a particular policy. It may be better to use the extra premium to increase important benefits such as daily benefit amounts. Levels Of Services Policies being sold today in Iowa with nursing home coverage must cover all levels of nursing home care. Skilled level of care means skilled services are provided on a daily basis. Skilled services are for medical conditions and must be done or supervised by licensed professionals such as registered nurses or speech therapists. A physician must order the care. Usually, skilled level of care is short term. Most residents in a nursing home are NOT at the skilled level of care. 9. 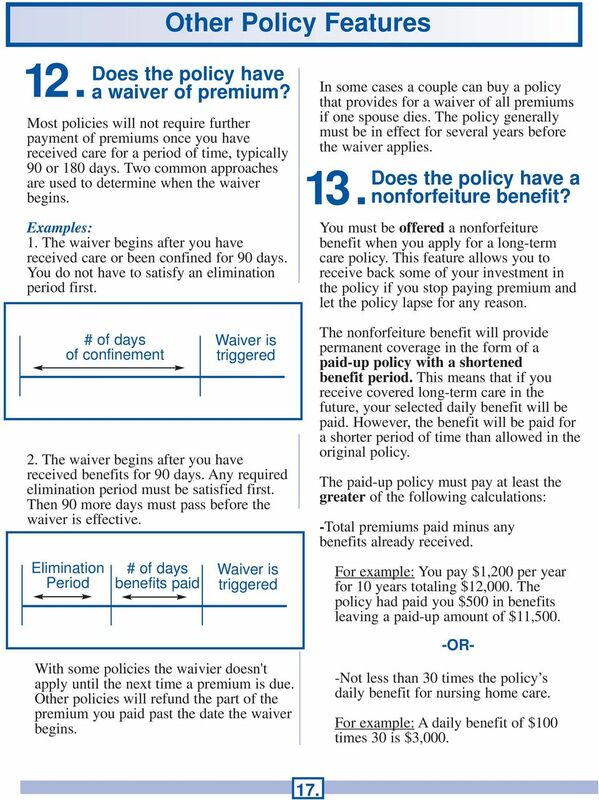 12 If you own a policy purchased before July 1, 1989, check to see if it limits coverage to skilled care only or has significantly better coverage for skilled care than other types of care. Policies sold in Iowa after July 1, 1989 cannot limit coverage to skilled care only. NOTE: Skilled care is the only level of nursing home care Medicare covers. Medicare may pay all or part of the costs for up to100 days of approved daily skilled care. The care must be received in a Medicare-approved skilled nursing facility. Intermediate level of care requires daily nursing supervision by a registered nurse. Individuals needing intermediate care are in stable condition. Some skilled services may be required but not on a daily basis. Custodial/personal level of care is help with activities of daily living (ADLs). These include bathing, dressing, eating, toileting, moving from bed to chair, maintaining continence, taking medicine and other routine activities. This is the least intensive of the three levels of care. It's important that your policy cover custodial care since many need only this level of care when entering a nursing home. How Much Will the Policy Pay? 4. How much does the policy pay per day? One of the choices you will make when buying long-term care insurance is the amount it will pay for each day of care. Premiums are based on every $10 of benefits purchased. Buying a policy with a daily benefit higher than you need might waste dollars. Total cost where you may receive care Even if you buy your policy in Iowa, it will pay in any state if the policy s requirements are met. However, daily costs in some parts of the country are two to three times the cost of care in Iowa. It's important you select a daily benefit appropriate for the area in which you are likely to receive care. Amount you can pay toward cost Amount to insure To decide what daily amount to choose, check the current nursing home rates in the area where you may receive care. 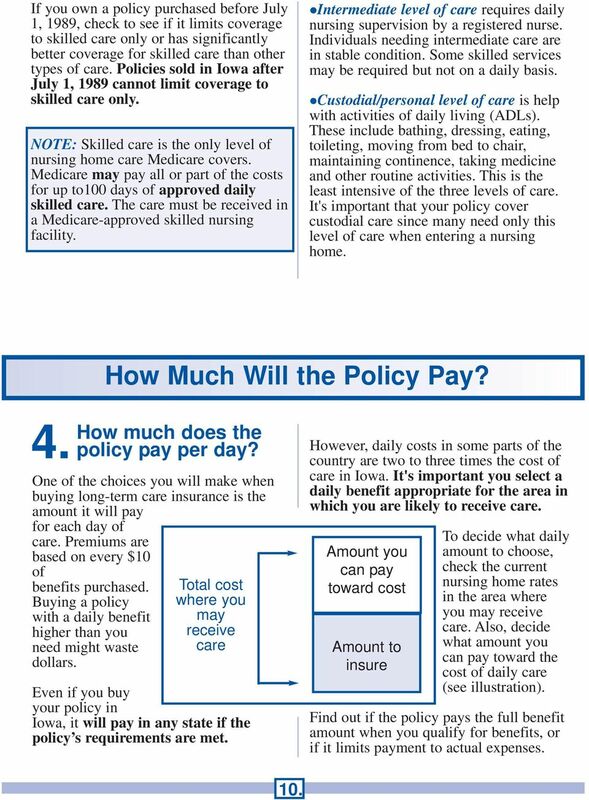 Also, decide what amount you can pay toward the cost of daily care (see illustration). Find out if the policy pays the full benefit amount when you qualify for benefits, or if it limits payment to actual expenses. 10. 13 Benefits paid for home health care, respite care, adult day care and other types of care are often less than the nursing home benefit. 5. Are benefits adjusted for inflation? Nursing home and other long-term care rates increase regularly. At an inflation rate of just 5% a year, a nursing home with a daily cost of $100 today will cost $155 in 10 years and $250 in 20 years. C os t Time When applying for a long-term care insurance policy, you must be offered inflation protection. The offer must include one option with increases of at least 5% compounded annually. Inflation offers also can be simple increases of more or less than 5%. Whether the inflation adjustment is done on a simple or compounded basis can make a big difference. A $70 daily benefit increased by a simple 5% each year will be worth $140 in 20 years. It will pay $180 if compounded annually. Policies issued after February 1, 2003 will include inflation protection unless you sign a rejection statement. Also, inflation adjustments must continue regardless of age, claims paid or how long the policy has been in force. 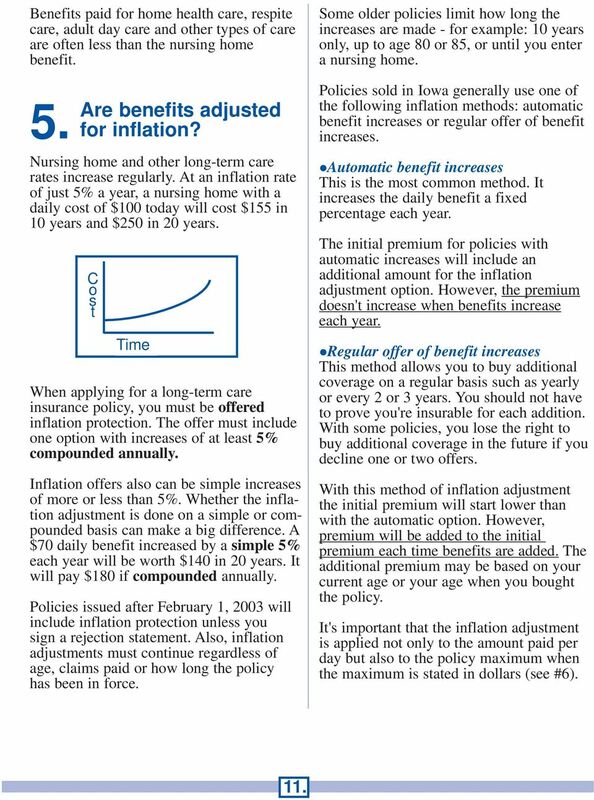 Some older policies limit how long the increases are made - for example: 10 years only, up to age 80 or 85, or until you enter a nursing home. Policies sold in Iowa generally use one of the following inflation methods: automatic benefit increases or regular offer of benefit increases. Automatic benefit increases This is the most common method. It increases the daily benefit a fixed percentage each year. The initial premium for policies with automatic increases will include an additional amount for the inflation adjustment option. However, the premium doesn't increase when benefits increase each year. Regular offer of benefit increases This method allows you to buy additional coverage on a regular basis such as yearly or every 2 or 3 years. You should not have to prove you're insurable for each addition. With some policies, you lose the right to buy additional coverage in the future if you decline one or two offers. With this method of inflation adjustment the initial premium will start lower than with the automatic option. However, premium will be added to the initial premium each time benefits are added. The additional premium may be based on your current age or your age when you bought the policy. It's important that the inflation adjustment is applied not only to the amount paid per day but also to the policy maximum when the maximum is stated in dollars (see #6). 11. 14 Inflation protection will add significantly to your premium. However, consider the consequences if the policy benefit plus payments from your income won't pay the full bill. The assets you want to protect may have to be used to cover the shortfall. It is sometimes suggested you buy a higher daily benefit to protect against future costs instead of taking one of the two options just discussed. Make careful calculations before considering this approach. 6. How long do benefits last? Policy Maximum Most policies place limits on the total amount of benefits they will pay in your lifetime. The following are commonly offered options: - A number of years or days - From a minimum of one year to lifetime. - A specified dollar amount such as $50,000, $100,000 or more. - A pool of benefits -A dollar amount is calculated on the basis of your daily benefit choice times the number of days/years chosen. For example, $100 per day benefit for 3 years equals $109,500 maximum benefit: (3 yrs. x 365 days x $100 = $109,500). - A number of visits for some services such as home care. - Shared benefits when both spouses are insured - For example, each spouse has 4 years of benefits. If one spouse uses all 4 years, that spouse may begin to use the benefits of the other spouse. A longer period of coverage is possible for the first spouse needing care, but the other spouse can be left with less coverage. A maximum benefit can be listed individually for each type of care or one maximum can apply for all benefits combined. 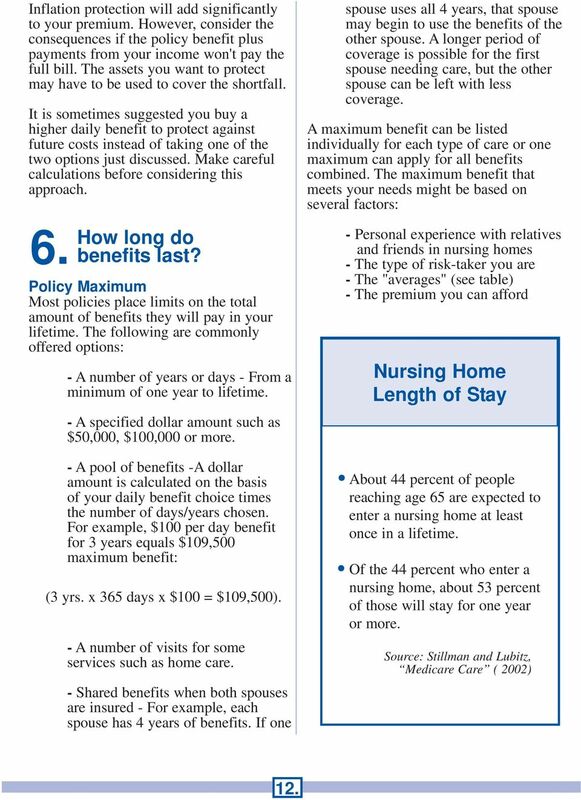 The maximum benefit that meets your needs might be based on several factors: - Personal experience with relatives and friends in nursing homes - The type of risk-taker you are - The "averages" (see table) - The premium you can afford Nursing Home Length of Stay About 44 percent of people reaching age 65 are expected to enter a nursing home at least once in a lifetime. Of the 44 percent who enter a nursing home, about 53 percent of those will stay for one year or more. Source: Stillman and Lubitz, Medicare Care ( 2002) 12. 15 Restoration of Benefits A few policies "restore" benefits. You may collect benefits for a period of time to recover from an illness. Then you no longer need care and do not collect benefits for an amount of time stated in the policy. Your maximum benefit will go back to the original amount. 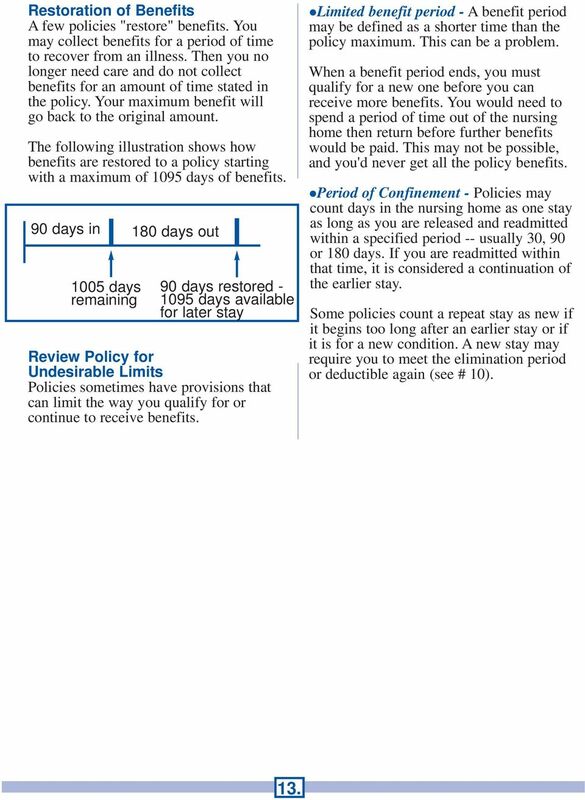 The following illustration shows how benefits are restored to a policy starting with a maximum of 1095 days of benefits. 90 days in 180 days out 1005 days remaining 90 days restored days available for later stay Review Policy for Undesirable Limits Policies sometimes have provisions that can limit the way you qualify for or continue to receive benefits. Limited benefit period - A benefit period may be defined as a shorter time than the policy maximum. This can be a problem. When a benefit period ends, you must qualify for a new one before you can receive more benefits. You would need to spend a period of time out of the nursing home then return before further benefits would be paid. This may not be possible, and you'd never get all the policy benefits. Period of Confinement - Policies may count days in the nursing home as one stay as long as you are released and readmitted within a specified period -- usually 30, 90 or 180 days. If you are readmitted within that time, it is considered a continuation of the earlier stay. Some policies count a repeat stay as new if it begins too long after an earlier stay or if it is for a new condition. 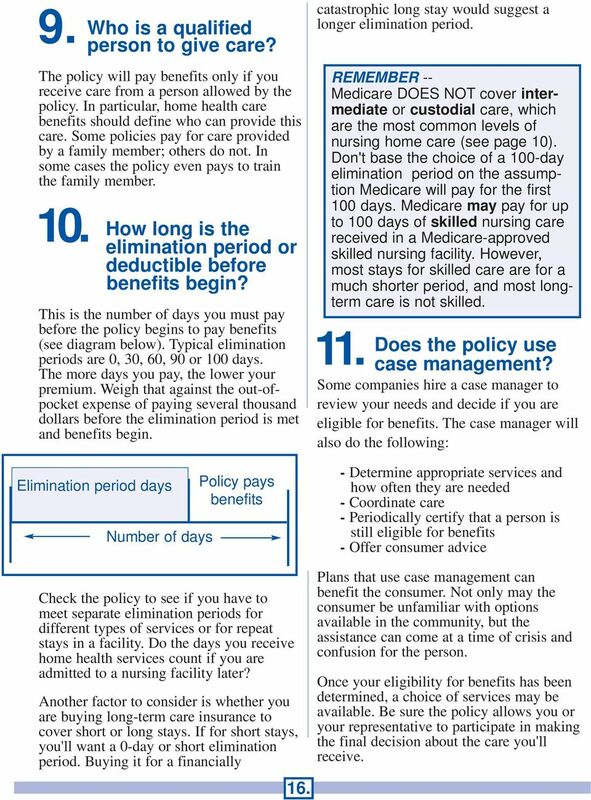 A new stay may require you to meet the elimination period or deductible again (see # 10). 13. 16 How Do You Qualify for Benefits? I t's critical that you understand this part of your policy. 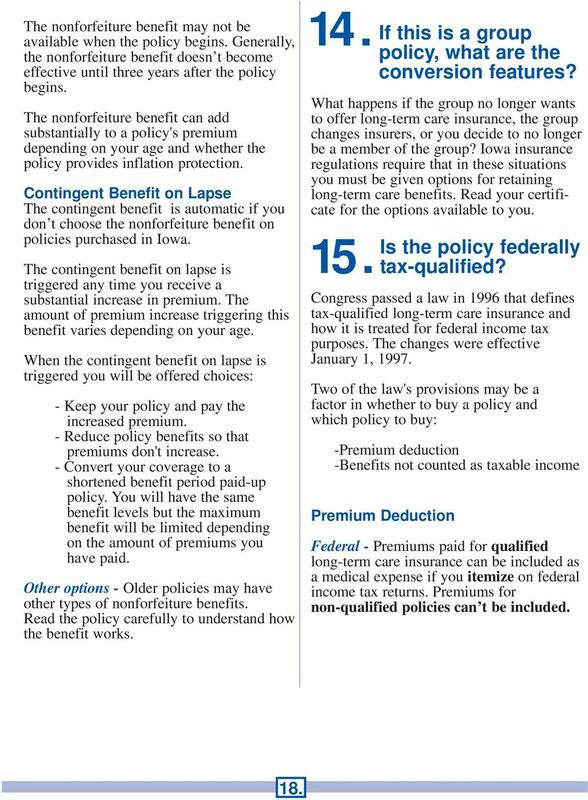 You may carefully research and select benefits, but if you don't qualify for benefits as described in the policy, you won't be able to collect. Conditions you must meet to qualify for benefits are often referred to as "gatekeepers." Before benefits are paid you must: 7. -Meet the level of need - what causes you to be unable to care for yourself? -Be in a qualified place -Receive care from a qualified person -Meet the elimination period What level of need is required? The level of need shows why you are unable to care for yourself. What can you not do, or why can you not be left alone? You must meet the level of need before any benefits are paid regardless of the types of services the policy covers. For example, although assisted living may be covered, benefits won't be paid until you are unable to do your activities of daily living or have cognitive impairment (see below). Certifying Your Condition Most policies require that someone assess your condition to see what care you need. Generally, this is a doctor or other licensed health care practitioner such as a nurse or social worker. The assessment will show that you're unable to care for yourself because of one of the following: Medical necessity for illness or injury - An illness such as Parkinson's disease or multiple sclerosis may cause you to be unable to care for yourself. An injury such as a broken hip can cause you to need help until you have recovered enough to care for yourself. Illness or injury may lead to a nursing facility stay; however, it's important that the policy also allow for other ways to qualify for benefits. A person who is extremely frail and unable to live independently may not meet the requirement for illness or injury but need long-term care. Functional incapacity - This means you are physically unable to do Activities of Daily Living (ADLs) without help. ADLs include bathing, dressing, eating, toileting, moving from bed to chair and maintaining continence. Policies pay benefits if you are unable to perform a specified number of ADLs (usually two or three). Policies define very clearly what is meant by each ADL. Others just list them leaving room for interpretation. A definition requiring substantial or hands-on assistance from someone makes it more difficult to qualify than one that refers to supervision of activities. Cognitive impairment - This is a decrease in or loss of intellectual abilities. Cognitive impairment doesn't include mental illness. Certain tests are generally used to assess mental ability or cognitive impairment. 14. 17 If the policy determines eligibility on the basis of ADLs only, those with dementia who can physically perform ADLs won't collect. A policy including cognitive impairment as a qualifier will be more likely to pay. Is Alzheimer's disease covered? 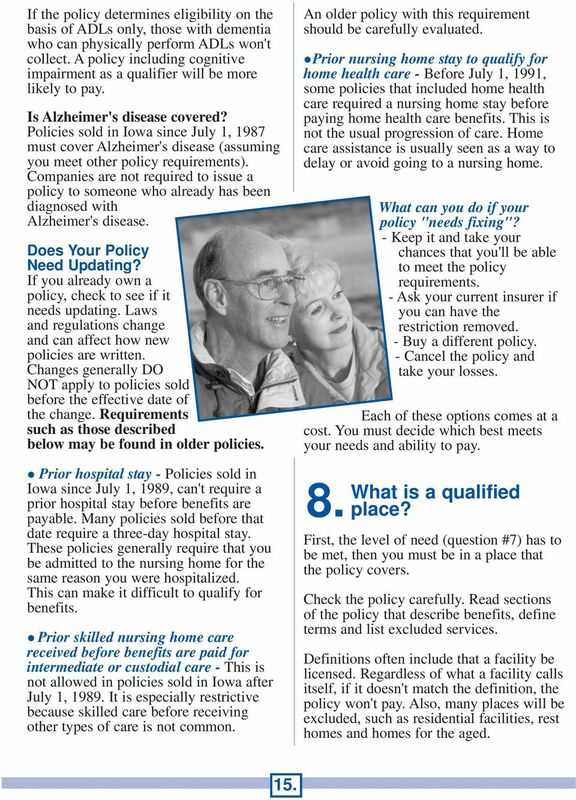 Policies sold in Iowa since July 1, 1987 must cover Alzheimer's disease (assuming you meet other policy requirements). Companies are not required to issue a policy to someone who already has been diagnosed with Alzheimer's disease. Does Your Policy Need Updating? If you already own a policy, check to see if it needs updating. Laws and regulations change and can affect how new policies are written. Changes generally DO NOT apply to policies sold before the effective date of the change. Requirements such as those described below may be found in older policies. Prior hospital stay - Policies sold in Iowa since July 1, 1989, can't require a prior hospital stay before benefits are payable. Many policies sold before that date require a three-day hospital stay. These policies generally require that you be admitted to the nursing home for the same reason you were hospitalized. This can make it difficult to qualify for benefits. Prior skilled nursing home care received before benefits are paid for intermediate or custodial care - This is not allowed in policies sold in Iowa after July 1, It is especially restrictive because skilled care before receiving other types of care is not common. An older policy with this requirement should be carefully evaluated. Prior nursing home stay to qualify for home health care - Before July 1, 1991, some policies that included home health care required a nursing home stay before paying home health care benefits. This is not the usual progression of care. Home care assistance is usually seen as a way to delay or avoid going to a nursing home. What can you do if your policy "needs fixing"? - Keep it and take your chances that you'll be able to meet the policy requirements. - Ask your current insurer if you can have the restriction removed. - Buy a different policy. - Cancel the policy and take your losses. Each of these options comes at a cost. You must decide which best meets your needs and ability to pay. 8. What is a qualified place? 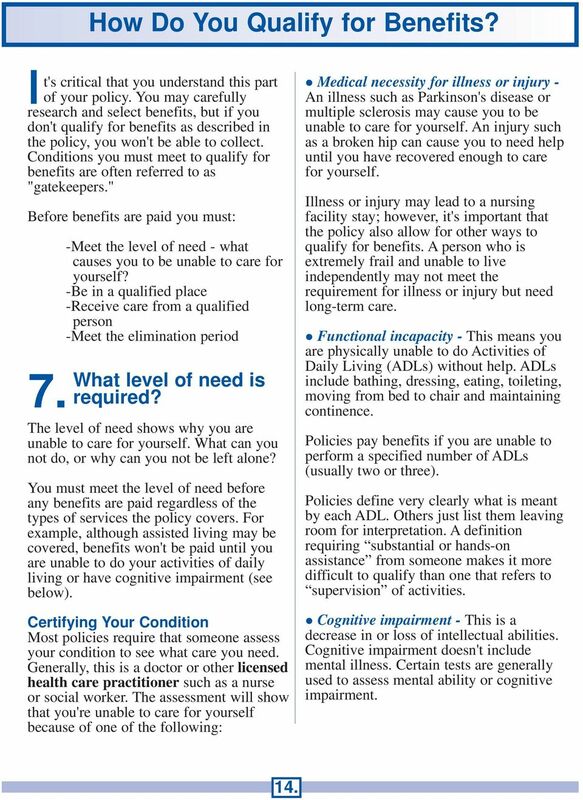 First, the level of need (question #7) has to be met, then you must be in a place that the policy covers. Check the policy carefully. Read sections of the policy that describe benefits, define terms and list excluded services. Definitions often include that a facility be licensed. Regardless of what a facility calls itself, if it doesn't match the definition, the policy won't pay. Also, many places will be excluded, such as residential facilities, rest homes and homes for the aged. 15. 18 9. Who is a qualified person to give care? The policy will pay benefits only if you receive care from a person allowed by the policy. In particular, home health care benefits should define who can provide this care. Some policies pay for care provided by a family member; others do not. In some cases the policy even pays to train the family member. 10. How long is the elimination period or deductible before benefits begin? This is the number of days you must pay before the policy begins to pay benefits (see diagram below). Typical elimination periods are 0, 30, 60, 90 or 100 days. The more days you pay, the lower your premium. Weigh that against the out-ofpocket expense of paying several thousand dollars before the elimination period is met and benefits begin. Elimination period days Number of days Policy pays benefits Check the policy to see if you have to meet separate elimination periods for different types of services or for repeat stays in a facility. Do the days you receive home health services count if you are admitted to a nursing facility later? Another factor to consider is whether you are buying long-term care insurance to cover short or long stays. If for short stays, you'll want a 0-day or short elimination period. Buying it for a financially 16. catastrophic long stay would suggest a longer elimination period. REMEMBER -- Medicare DOES NOT cover intermediate or custodial care, which are the most common levels of nursing home care (see page 10). Don't base the choice of a 100-day elimination period on the assumption Medicare will pay for the first 100 days. Medicare may pay for up to 100 days of skilled nursing care received in a Medicare-approved skilled nursing facility. However, most stays for skilled care are for a much shorter period, and most longterm care is not skilled. 11. Does the policy use case management? Some companies hire a case manager to review your needs and decide if you are eligible for benefits. The case manager will also do the following: - Determine appropriate services and how often they are needed - Coordinate care - Periodically certify that a person is still eligible for benefits - Offer consumer advice Plans that use case management can benefit the consumer. Not only may the consumer be unfamiliar with options available in the community, but the assistance can come at a time of crisis and confusion for the person. Once your eligibility for benefits has been determined, a choice of services may be available. Be sure the policy allows you or your representative to participate in making the final decision about the care you'll receive. 20 The nonforfeiture benefit may not be available when the policy begins. Generally, the nonforfeiture benefit doesn t become effective until three years after the policy begins. The nonforfeiture benefit can add substantially to a policy's premium depending on your age and whether the policy provides inflation protection. Contingent Benefit on Lapse The contingent benefit is automatic if you don t choose the nonforfeiture benefit on policies purchased in Iowa. The contingent benefit on lapse is triggered any time you receive a substantial increase in premium. The amount of premium increase triggering this benefit varies depending on your age. When the contingent benefit on lapse is triggered you will be offered choices: - Keep your policy and pay the increased premium. - Reduce policy benefits so that premiums don't increase. - Convert your coverage to a shortened benefit period paid-up policy. You will have the same benefit levels but the maximum benefit will be limited depending on the amount of premiums you have paid. Other options - Older policies may have other types of nonforfeiture benefits. Read the policy carefully to understand how the benefit works. 14. If this is a group policy, what are the conversion features? What happens if the group no longer wants to offer long-term care insurance, the group changes insurers, or you decide to no longer be a member of the group? Iowa insurance regulations require that in these situations you must be given options for retaining long-term care benefits. Read your certificate for the options available to you. 15. Is the policy federally tax-qualified? Congress passed a law in 1996 that defines tax-qualified long-term care insurance and how it is treated for federal income tax purposes. The changes were effective January 1, Two of the law's provisions may be a factor in whether to buy a policy and which policy to buy: -Premium deduction -Benefits not counted as taxable income Premium Deduction Federal - Premiums paid for qualified long-term care insurance can be included as a medical expense if you itemize on federal income tax returns. Premiums for non-qualified policies can t be included. 18. 21 Medical expenses must total 7.5% of adjusted gross income before a deduction is allowed. Only the medical expenses greater than 7.5% can be deducted. The amount of premium that can be included as a medical expense is subject to the following limits. Age of Deductible individual limits (2009) 40 or less $ through 50 $ through 60 $ 1, through 70 $ 3, or older $ 3,980 Limits are for each individual per taxable year. Dollar amounts are changed each year for inflation. State of Iowa - Premiums for long-term care insurance can be included in the income adjustment for medical insurance premiums. This provides for a direct reduction in taxable income. Taxability of Benefits Payments made under long-term care insurance for qualified long-term care services are generally not counted as taxable income. For 2009, the limit is $280/day or $102,200/year. Any amount received for qualified long-term care services over the limit is not counted if it pays for actual costs. An insurance company must report any benefits it pays under a long-term care policy. The report will go to the policyholder and the IRS by January 31, following the taxable year-end. Payments for non-qualified long-term care services may be taxable as income. 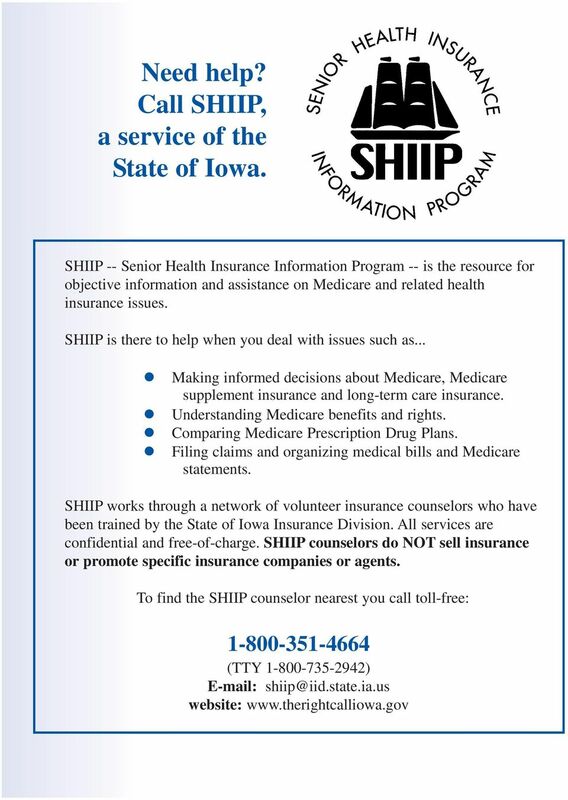 Neither SHIIP nor the Iowa Insurance Division provides tax advice. The IRS rules on all tax questions. The Iowa Insurance Division doesn't take responsibility for decisions regarding tax law application to long-term care insurance. What Is "Qualified" Long-Term Care Insurance? 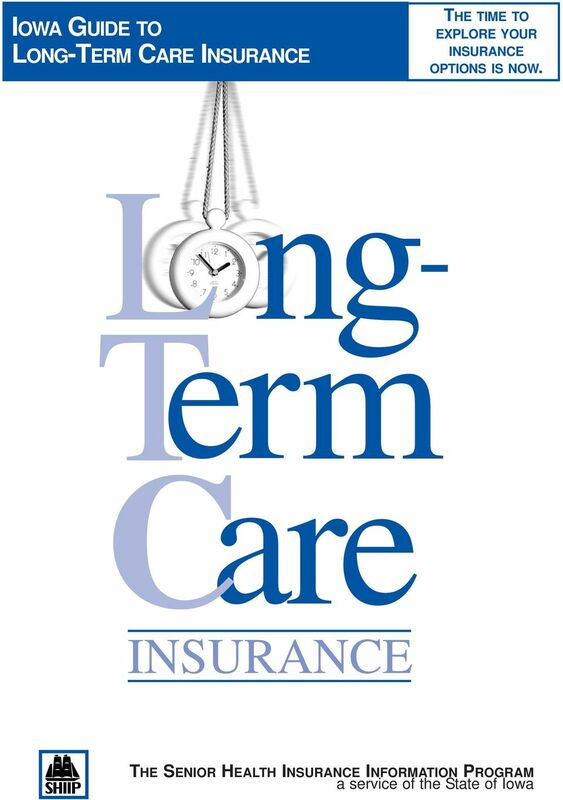 Long-term care insurance effective BEFORE January 1, Long-term care insurance issued before January 1, 1997, meeting state requirements in the state where it was issued is recognized as federally tax-qualified long-term care insurance. A policy may lose its tax-qualified status if you change it, such as adding benefits or reducing requirements to become eligible for benefits. Long-term care insurance effective January 1, 1997 or later - Both tax-qualified and non-tax-qualified longterm care insurance can be sold in Iowa. The policy will state if it is intended to be a tax-qualified plan. What about life insurance policies with long-term care riders - A long-term care rider that is part of a life insurance policy is treated like a separate long-term care policy and must meet the same requirements to be qualified. Only the premium payment for the long-term care portion of the policy would be deductible. Eligibility Based on "Chronically ill" The law requires that tax-qualified plans pay benefits only if you are "chronically ill" (see page 20). Services provided must be based on a plan of care prescribed by a licensed health care practitioner (see page 14). 19. 22 No benefits are paid for any services the policy may cover until you meet the requirements for chronically ill. This is defined in two ways. Functional incapacity This limitation is based on being unable to perform at least two activities of daily living (ADLs). The ADLs must be from this list: eating, toileting, transferring, bathing, dressing and continence. You are chronically ill when you are unable to perform at least two ADLs without substantial assistance from another person for at least 90 days. The 90 days is an assessment of your condition only. It doesn't affect any elimination period a policy has. If you unexpectedly regain your abilities before 90 days are past, your benefits are not affected. -OR- Cognitive impairment This limitation is based on loss of intellectual capacity. It is measured as loss in: short or long-term memory; orientation to people, places or time; and deductive or abstract reasoning. You are chronically ill when you are in need of substantial supervision due to severe cognitive impairment. Annual Cost 16. What does the policy cost per year? Initial Premium Several choices affect the premium: the types of services covered, the daily benefit, inflation protection, how long benefits are paid, the elimination period, conditions for eligibility and nonforfeiture benefits. Your age at the time of purchase is also a key factor. Premiums are more affordable when you are younger. However, you will be paying premiums longer than if you wait until a later age to buy a policy. On the other hand, you may develop health conditions that will make you unable to buy insurance later. When you apply for a long-term care policy, you will receive information about premium rates related to that policy. The information will include the following: -The rate schedule in effect at the time. -A statement that future rate increases may occur. -An explanation of why future increases might occur and what your options would be if that happens. -Information about rate increases over the past ten years. 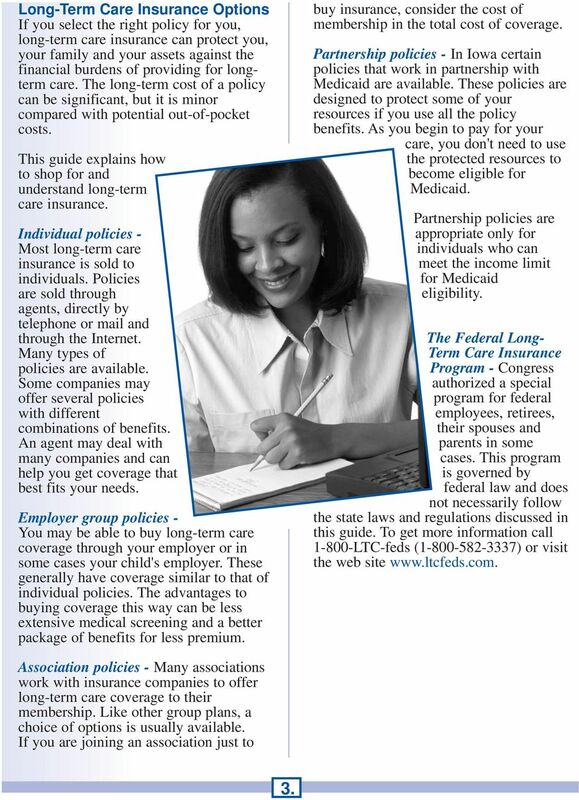 Basic policy - The basic policy may or may not contain all the benefit choices you want. Some companies offer a basic policy with limited benefits and options to add more features. Other companies offer comprehensive policies that include basic benefits plus extra policy features in one package. Riders - Additional options sold separately from the basic policy are called riders. A separate premium can be charged for each rider you choose. 20. 23 Administrative fee - A company can charge an administrative or processing fee in addition to the premium. Most often this is a one-time fee when the policy is first issued. Group membership fee - If you join an organization for the sole purpose of buying insurance through the organization, the membership fee is part of the cost of having the insurance. Add these fees to the premium when you consider the cost of the policy. Spouse discount - A premium discount may be available if each spouse is able to buy a policy. Check to see if you lose the discount when one spouse dies. Mode of payment - Annual premiums often give a price break over quarterly or semi-annual payments. Monthly payments through automatic bank draft may cost no more and sometimes cost less than one annual payment. Premium Increases Future increases in health care costs will not necessarily result in higher long-term care insurance premiums. This is because the insurance company's obligation is limited by the daily benefit amounts stated in the policy. The maximum amount payable per day will not increase just because nursing home rates increase. Companies are allowed to increase premiums if necessary for reasons such as an unexpected number or amount of claims. Premiums can't be increased for individuals only, but must be applied to a group such as all the policyholders in Iowa. Regulations effective February 1, 2003 make rates more stable and increases less likely. These regulations apply to all new individual and group policies issued on or after February 1, However they DO NOT apply to individual policies issued before February For group policies issued before February 1, 2003 the new regulations apply beginning on the first renewal date after July 1, Insurance companies are required to certify that rates on new policies are designed so increases should not be necessary. Any request to increase rates in the future must provide substantial documentation to show why it is necessary. Policies issued in Iowa since January 26, 1994 cannot increase premiums based solely on age after age 65. Beware of the word "level." This implies your premium will never increase. Use of this term is prohibited when premiums can increase. Report any use of the term to the Iowa Insurance Division. Rate history - Information about rate changes for individual companies is available on the Iowa Insurance Division website at Reg/LifeHealth/docs/ltc.pdf Consider not only if you can afford the premium now but also if you can handle potential premium increases in the future. 21. 24 OTHER APPROACHES FOR LTC COVERAGE SHIIP Life Insurance L ife insurance can sometimes be a source of benefits for long-term care. The benefits may be received in the form of an accelerated death benefit or defined benefits within the life policy. An accelerated death benefit means you can be paid some of the death benefit amount for specific conditions such as a terminal illness, confinement in a nursing home or long-term care expenses. Defined benefits will detail the services covered, benefit amounts and limits on maximum benefits payable. Either the accelerated death benefit or the defined longterm care benefits can be a part of the basic life policy or added to the policy as a separate rider. Long-term care riders to life insurance must meet laws and regulations related to long-term care policies. *** Because of the unique nature of life insurance, the following questions also should be asked. *** Why is life insurance a good purchase for you at this time? The lure of life insurance for some people is if they don't use the nursing home benefit, not all is lost. However, remember the most common reason to buy life insurance is to protect others against sudden and unexpected loss of your income. Most retirees do not need to buy life insurance. If they do, it will be expensive because of their age. While the long-term care coverage is attractive, remember part of the premium pays for life insurance that might not be needed. This leaves less premium to buy long-term care benefits. If you already have a life insurance policy, you may be able to add a long-term care rider to it. Will the life insurance policy still serve the original purpose for which it was purchased? Check carefully to determine what impact the rider will have on other features of the policy. Will the long-term care benefits affect any values in the policy? If long-term care benefits are paid from the policy, will the amount paid for death benefits be reduced? Will it affect the amount you could receive if you cashed in the policy while you are alive? Does a loan against the policy affect the long-term care benefits available? Having a loan may reduce benefits available or may be an obstacle to qualifying for benefits. Using long-term care benefits may also affect your access to policy values for a future loan. How does the policy pay long-term care benefits? Life insurance policies may pay a percentage of the face value or cash value for daily nursing home care rather than 22.